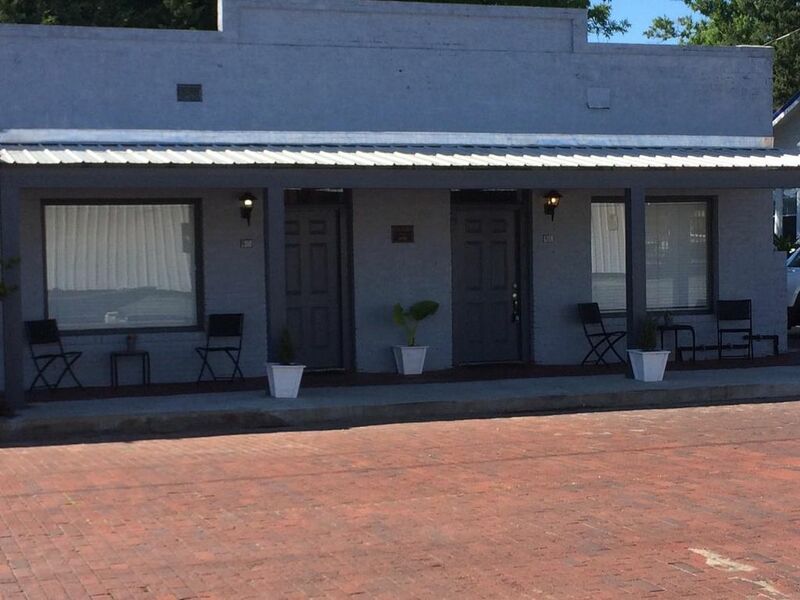 Lu-Zan Suites – Suite B is a one bedroom suite located in the historic commercial district of New Iberia on the only brick street in town. Walking distance to downtown and Bouligny Plaza, home of the Annual World Championship Gumbo Cook-off and Sugarcane Festival. It is also walking distance to the farmers market, food truck festival, nearby restaurants, shopping and night clubs. Shadows on the Teche is also walking distance (six blocks through historic downtown). The suite comes with a full kitchen, queen size bed, sleeper sofa, cable TV, free WIFI, iron, hair dryer, coffee maker and much more. Small dogs are always welcome. If Suite B is booked, check out its sister suite right next door - Suite A. Parking is on the side of the building. Drive into the driveway of the house next door and park by the building. If you prefer, you can park on the street. Living room and kitchen are combined. Full kitchen with dishes, pots, pans, etc. Small backyard for pets. Pets will have to be kept on a lease outside as there is no fencing. Patio outside the back door. Smoking is permitted on the patio. We enjoyed our stay. The weather was cold, so we were happy the heat worked well! Plenty of towels and blankets. The apartment was very clean. Plus, off-street parking was nice. Thank you!! Great couple. Never really knew they were there. They were always gone having a good time. Hope to have them again. Enjoyed our stay, unit was well maintained and very clean. Property owners were very responsive to any questions or concerns we had. Would recommend unit. We enjoyed having Paula and hopes she returns. We have not been open long but have enjoyed each and every one of our guests. Everyone is so thoughtful with our property. to add except we really appreciated the washer and dryer. Great! This was an excellent rental and we have stayed in many. Thanks to John and Lynda for a great stay from Dec 03 to Dec 10. 2018. John and I are so happy you enjoyed your stay. Hope to see you again! What a fantastic vacation rental! Our two night stay at the Lu-Zan was everything we expected and more. This newly remodeled home was just fabulous. First, the photos do not do the home justice. From the high ceilings adorned with crown molding and rustic beams to the brick exterior wall to the beautifully stained concrete floors, this home is comfortably and stylishly appointed. The queen size bed and linens were so comfortable. The owners thoughtfully stocked the bedroom closet with tons of extra pillows, blankets and sheets. The bathroom was also well stocked with bath linens. The open kitchen is furnished with anything you’d need to prepare a meal for four, and the place settings as well. Plenty of brand new kitchen towels and cloths made it easy to clean up. I also really appreciate the back patio area with a bistro table and two chairs overlooking the large back yard. We love New Iberia - the people, art & culture and THE FOOD! Clementine’s is a work of art with their craft cocktails and highly elevated food pairings. You can’t go wrong with breakfast or lunch at Victor’s Cafe. The rental home is within walking distance of both! We highly recommend visiting the Jungle Gardens and Tabasco Factory. And the food at the Jefferson Cafe was decadent! We can’t wait to visit New Iberia again and will definitely book our stay at The Lu-Zan each time we return. Thanks so much, John & Linda for opening your home to us this weekend. God Bless! We certainly enjoyed having you. Thank you for your kind words. We cannot wait to see you again. We are so glad you loved New Iberia.